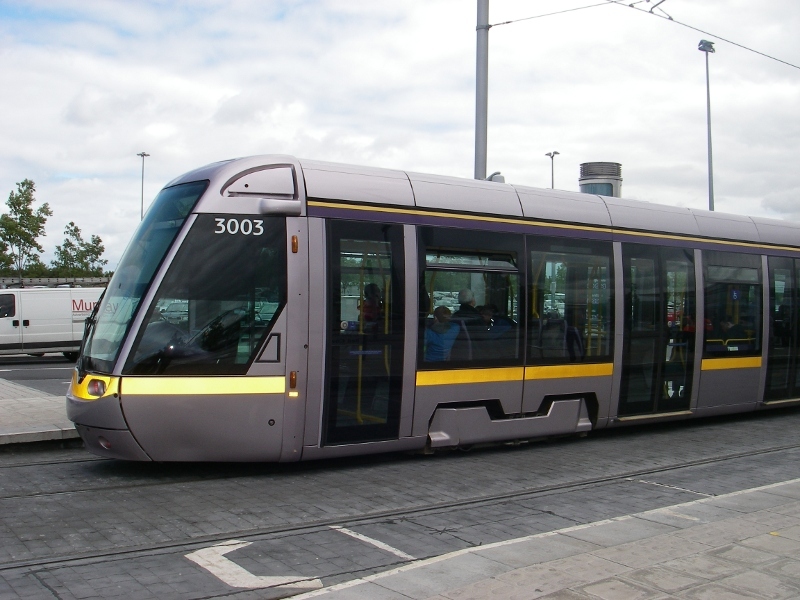 This is Dublin's light rail system, called the Luas. There are two lines running through the city; the red line and the green line. 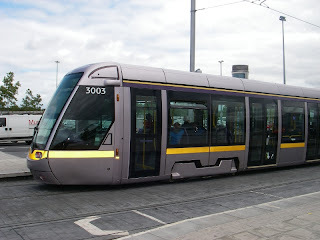 The Luas trains are quiet, have a pretty smooth ride, and are generally clean inside. Compared with public transportation in other cities, the Luas costs more. For example, it costs €2.10 to take the Luas from Red Cow station to Jervis street in town, about 11 km. Riding the entire red line from end to end costs €2.50. Transfer between Luas trains is not allowed with one ticket. In contrast, the Paris Metro costs €1.70 to ride anywhere; transfer between tracks is allowed and expected. The Luas has 38 km of track, the Paris Metro has 214 km of track. Despite the higher-than-average cost, I do like riding the Luas. It is fairly quick and the time between trains is short, so there is not much waiting around. I love this way of travel (as a thought because I've never taken it myself). Nice to read it's clean, too. How do you pronounce Luas? Is it Loo-as? Yes, it is pronounced like Lew-os. Wikipedia says it is the Irish word for "speed." The cars are pretty decent and free of graffiti. The cars have video cameras inside them with little signs saying, "Smile, you're on CCTV." The people are generally nice; the only thing that bugs me is children riding unsupervised and horsing around. There were two little boys who were beating the snot out of each other, swinging on poles and doing ninja kicks at each other, last time I was on. (rolls eyes) Seriously parents, keep your monkeys on a leash. Oh my, I would not have cared for that either! Little hellions. I do love to visit cities that have a good public transportation system. Paris and Boston come to mind. Glad that the public transportation is clean! LOL about the ninja kicking monkeys.